I'm not sure whether I should find this hilarious or be insulted, but I'm leaning toward the former. 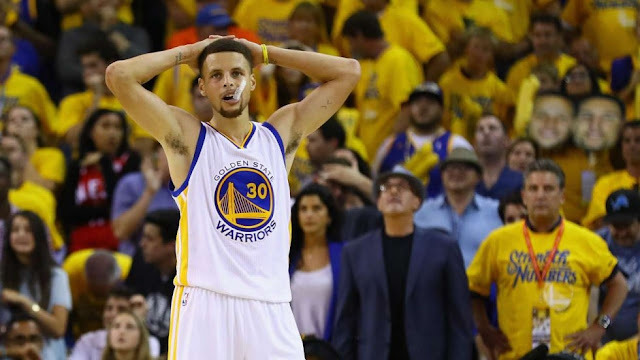 The Golden State Warriors, who broke the NBA's regular season wins record with 73, fell to LeBron James and the Cleveland Cavaliers in Game 7 of the NBA Finals last night. Not only did the Cavs win Game 7 in Oakland, they overcame a 3-1 series deficit to do so. Many have compared the Warriors collapse in the finals to the Patriots 2007 Super Bowl loss to the New York Giants...you know...18-1. Warriors fans are understandably devastated today, and will be for some time. How the Warriors won 73 games in the regular season and didn't take home a second straight title is baffling. Some Warriors fans were so distraught, they asked Patriots fans how to deal with losing a game of such magnitude. Many believe this collapse by Golden State is worse than the Patriots losing to the Giants in the Super Bowl. While you can certainly make the argument that it is, no sports defeat in New England has ever, or will ever, come close to that Super Bowl. Even though the LeBron ball-washing from ESPN and other major sports networks is pretty insufferable, at least the Cavaliers' series win gave us this thread to laugh at.